Social and economic factors have crippled golf’s popularity. Is a golf boom coming to China? With a population over a billion, millionaires in the millions, and the world’s second-largest economy – it’s only a matter of time, right? Don’t bet on it. At least not in the near future, and perhaps not even in the distant future. Both Chinese and Western entrepreneurs have spent at least a decade now trying to give golf some momentum in the world’s most populous nation. There are more major golf events held in China than ever before. The biggest stars are dropping by to play exhibitions annually, and a handful of Chinese golfers are making appearances in the sport’s biggest tournaments. For its part, Augusta National Golf Club, home of the Masters tournament, has been the biggest champion in expanding the sport’s reach to China – and Asia. In 2007, Liang Wen-Chong was extended an invitation to play in the Masters, becoming the tournament’s first player from mainland China. The club then co-founded the Asia-Pacific Amateur Championship in 2009, with its champion gaining an automatic invitation to arguably the sport’s most prestigious event. With chairman Billy Payne looking on, this year’s Asia-Pacific Amateur concluded on Sunday, with South Korea’s Lee Chang-woo becoming the event’s fourth invitee to the Masters. Playing at the Nanshan International Golf Club in China’s Shandong Province, Lee bested China’s Guan Tianlang, who last year won the event and became the youngest Masters entrant at age 14. But despite the brilliance of Liang, Guan and a few other up-and-coming stars, golf is not catching on as either a spectator sport or, especially, a participatory sport in China. The biggest issue, first and foremost, is the lack of golf courses. After Mao Tze-tung won power in 1949, one of his first acts was to eradicate the bourgeois sport of golf and turn what few courses the country had at the time into farmland. The ban wasn’t officially rescinded until the 1980s, and the state again imposed a moratorium on building new golf courses in 2004. The few thriving clubs in China tend to be clustered in areas where there are many Western expats living – such as Shenzhen – or in major resort areas. The Mission Hills Group is the country’s biggest golf enterprise, having built 22 courses, including 10 on Hainan Island. Ken Chu, who heads the Mission Hills Group, argues that golf will have a future in China because it’s a sport of brain over brawn, which should appeal to the Chinese. But Chu’s optimism is belied by raw data on the country’s lack of a golfing boom. There are fewer than one million golfers in China (out of 1.3 billion people) and only 600 courses to play on – many of them far from population centers. The expense of playing is also prohibitive: A round of golf in China costs at least $100-$150, while the per capita income is only around $6,000. In contrast, there are more golf courses in states like California, Florida and even Michigan than in the whole of China. And many American courses are considerably cheaper than Chinese courses because they’re municipal or public layouts that are subsidized and/or are trafficked heavily. Such conditions do not exist in China and probably won’t in the near future. It’s safe to say that despite the presence of Tiger Woods and Rory McIlroy on Hainan Island this Monday, there was still more buzz in China from the visit of Kobe Bryant and the NBA’s Los Angeles Lakers last week. Woods and McIlroy were paid a handsome $3.5 million between them to play an 18-hole exhibition on a Mission Hills course in front of a large and well-heeled crowd. This news was not easily found on the sports front pages of Weibo.com or People’s Daily, which on Monday featured the Lakers, Chinese tennis star Li Na, Formula 1’s Sebastian Vettel and European soccer. 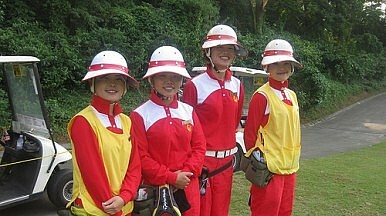 The lack of golf information for Chinese sports consumers probably reflects the fact that so few of them care. 14-year-old Guan Tianlang won the Silver Cup at the US Masters.